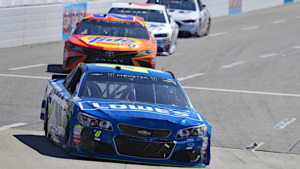 Note: Below is a Fantasy NASCAR Martinsville Speedway preview article from Wheels (@DK_Wheels) and PJ (@PJFrapDFS) of the Power Hour DFS (@PowerHourDFS) crew. Race number six on the NASCAR Monster Energy Cup Series brings us to the paperclip! Martinsville is a flat half mile oval that is shaped like a paperclip with long straightaways and sharp flat corners. It is really hard to pass here so certainly expect a lot of bump and runs this weekend. This gives the guys a chance to get back to their roots and really beat and bang on each other. Bottom line, this weekend's race should be entertaining. The last time we were here we had the Denny Hamlin and Chase Elliott incident in the playoffs where Denny just kind of drove through Chase going into turn 3 and Chase wrecked. The sights and sounds after that moment were pretty wild, Denny is from Virginia and he was getting booed off pit road after the race by the fans and just the opposite the fans were going crazy for Chase. Maybe we see something like that again but at the very least we can expect to see some great racing and plenty of beating and banging for position. Kevin Harvick - I think I speak for a lot of us when I say that I think we were robbed of a GREAT battle between Harvick and Truex last week. He was coming and was coming fast before ultimately wrecking out while battling for 3rd place with Kyle Larson and ending his hopes for a 4th consecutive win. Harvick is the most expensive driver again this week at $11,600 but something tells me that it's going to be the next two guys that steal a lot of the ownership this week.Kevin Harvick - I think I speak for a lot of us when I say that I think we were robbed of a GREAT battle between Harvick and Truex last week. He was coming and was coming fast before ultimately wrecking out while battling for 3rd place with Kyle Larson and ending his hopes for a 4th consecutive win. Harvick is the most expensive driver again this week at $11,600 but something tells me that it's going to be the next two guys that steal a lot of the ownership this week. Kyle Busch - Rowdy has been dominate here at Martinsville lately to say the least. He has rattled off five consecutive top 5's, including two wins while leading 813 laps during this stretch. That all equates to a 128.32 Driver Rating over that same period. He is going to be highly owned this week and he deserves every bit of your attention this weekend. Brad Keselowski - You can almost copy/paste the same write up from Kyle Busch… He has rattled off 4 consecutive top 5's including one win while leading 367 laps, which is good for a 120.7 Driver Rating over that stretch. It is going to be VERY hard not to just lock in Kyle Busch & Brad Keselowski this weekend, especially if we end up getting all of this weather that is in the forecast for Saturday which MAY wipe out ANY on track activity before the race on Sunday… Just line them up and let them loose! With our first 500 lap race of the year, we will NEED to nail down the top two dominators this weekend. On many different occasions we have seen four different drivers score 30+ dominator points within a Martinsville race. So, the easy answer here this week is a wide range from two to four dominators. Recent form has been solid, and Rowdy has put himself in position all season, so definitely fire him up this weekend where he has been ELITE. 24 Martinsville races under his belt and AGAIN, he is in the best equipment that he has even been in for his entire career.